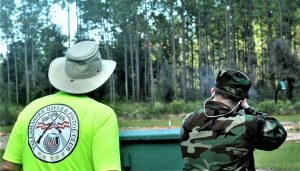 Events | TRPC | Tallahassee Rifle & Pistol Club, Inc. The Black Powder Match is open to anyone interested, including non-members. 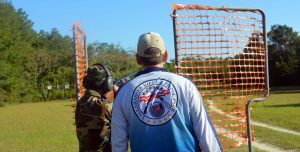 While started as a rifle match program, the program is also open to pistol and revolver shooters. 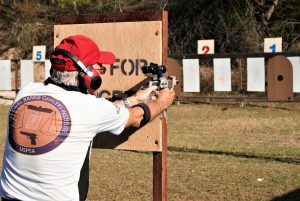 Cowboy action shooting is the fastest growing segment of the shooting world today. It’s much more than just dressing up like a cowboy or cowgirl. Set-up at 8:30am. Shooting starts at 9:00am. Entries will be accepted up to 8:45am. prior to firing. Entries will be limited to 28 competitors. There are four stages: Practical, Barricade, Mover, and Steel Plates. With the exception of one case in the Practical, all shooting is done freestyle. Relive your childhood plinking cans off a fence rail. This event is as close as you’ll ever get to those glory days again. Open to come to come participate or just spectate. The course will consist of 10 stations, 50 targets. Registration and squadding will open at 8:00 AM. The first squad will commence firing as soon as we have a full squad. Pre-squadding is available and recommended. Send your name and preferred start time to kfleming@earthlink.net. 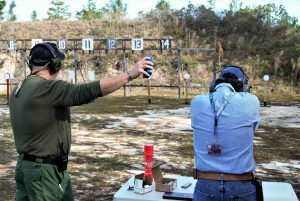 The Steel Challenge match is speed shooting steel targets with a pistol. Each stage has 5 steel targets, a mixture of 10”round, 12”round and 18”x24” rectangle steel target plates. Trapshooting is a game of movement, action and split-second timing. 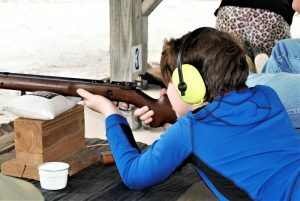 This program is an awesome opportunity for your children, grandchildren, nieces, nephews and neighborhood kids to safely learn about guns, gun safety and proper use & handling of firearms. 2nd Saturday every month 8:30am-11:30am. Participants must arrive by 8:30am to attend the mandatory Safety briefing.